Manolis Kellis is a computational biologist at MIT, known as one of the leaders in applying big data to genomics and gene regulatory networks. Throughout my 9 years at MIT, Manolis was one of my best friends there, even though our research styles and interests might seem distant. He and I were in the same PECASE class; see if you can spot us both in this photo (in the rows behind America’s last sentient president). My and Manolis’s families also became close after we both got married and had kids. We still keep in touch. Today Manolis will be celebrating his 42nd birthday, with a symposium on the meaning of life (!). He asked his friends and colleagues to contribute talks and videos reflecting on that weighty topic. Here’s a 15-minute video interview that Manolis and I recorded last night, where he asks me to pontificate about the implications of quantum mechanics for consciousness and free will and whether the universe is a computer simulation—and also about, uh, how to balance blogging with work and family. 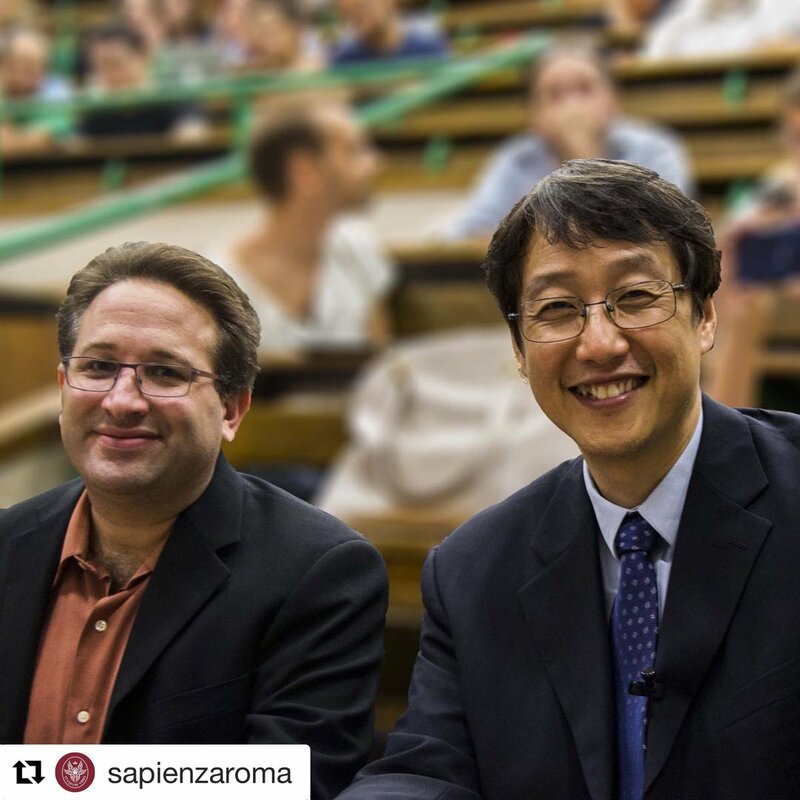 On Thursday, I had the incredible honor of accepting the 2018 Tomassoni-Chisesi Prize in Physics at Università “La Sapienza” in Rome—“incredible” mostly because I’m of course not a physicist. (I kept worrying they’d revoke the award when they realized I could barely solve the wave equation.) This is not the first time quantum information was recognized; the prize has previously gone to Serge Haroche and Alain Aspect. This year, for the first time, there was both an under-40 and an over-40 award; the latter went to Philip Kim, a quantum materials researcher at Harvard who I had the privilege to meet on this trip (he’s the taller one below). I’m unbelievably grateful, not only to the committee, and its chair Giorgio Parisi (whose seminal work on phase transitions and satisfiability I’d long known, but who I met for the first time on this trip), but to Fabio Sciarrino, Paolo Mataloni, Fernanda Lupinacci, and everyone else who graciously hosted me and helped make my hastily-planned visit to Europe a success. The department I visited has a storied history: here are the notes that Enrico Fermi left, documenting what he covered each day in his physics class in 1938. The reason the last squares are blank is that, when Fermi and his Jewish wife left for Stockholm on the occasion of Fermi’s Nobel Prize, they continued directly to the US rather than return to an Italy that had just passed the racial laws. On my way to Rome, I also gave two talks at a “quantum computing hackathon” in Zurich, called QuID (Quantum Information for Developers). Thanks so much to Lidia del Rio for arranging that visit, which was fantastic as well. I’ll discuss some of my work in quantum computing over the past 18 years, organizing it in terms of three questions. First, how can we demonstrate, using near-future hardware, that quantum computers can get any genuine speedups at all over classical computers (ideally useful speedups)? Second, what sorts of problems would be hard even for quantum computers, and can we turn the intractability of those problems to our advantage? Third, are there physically reasonable models of computation even more powerful than quantum computing, or does quantum computing represent an ultimate limit? Last night I was talking to my mom about my grandfather, who as it happens came through Rome 73 years ago, as an engineer with the US Army. Disabling landmines was, ironically, one of the safer ways to be a Jew in Europe at that time. If you’d told him then that, three-quarters of a century later, his grandson would be back here in Rome to accept an award for research in quantum computational complexity … well, I’m sure he’d have any number of questions about it. But one thing I clearly remember is that my grandfather was always full of effusive praise for the warmth of the people he met in Italy—how, for example, Italian farmers would share food with the hungry and inadequately-provisioned Allied soldiers, despite supposedly being on the opposing side. Today, every time I’m in Italy for a conference or a talk, I get to experience that warmth myself, and certainly the food part. There’s a view that scientists should just pursue the truth and be serenely unaffected by prizes, recognition, and other baubles. I think that view has a great deal to be said for it. But thinking it over recently, I struck the following mental bargain: if I’m going to get depressed on a semi-regular basis by people attacking me online—and experience shows that I will—well then, I also get to enjoy whatever’s the opposite of that with a clear conscience. It’s not arrogance or self-importance; it’s just trying to balance things out a bit! So again, thanks so much—to the physics department of La Sapienza, but also to my family, friends, mentors, readers, colleagues at UT Austin and around the world, and everyone else who helps make possible whatever it is that I do. Here it is, recorded last week at Y Combinator’s office in San Francisco. For regular readers of this blog, there will be a few things that are new—research projects I’ve been working on this year—and many things that are old. Hope you enjoy it! Thanks so much to Craig Cannon of Y Combinator for inviting me. Associated with the podcast, Hacker News will be doing an AMA with me later today. I’ll post a link to that when it’s available. Update: here it is. I’m at STOC’2018 TheoryFest in Los Angeles right now, where theoretical computer scientists celebrated the 50th anniversary of the conference that in some sense was the birthplace of the P vs. NP problem. (Two participants in the very first STOC in 1969, Richard Karp and Allan Borodin, were on a panel to share their memories, along with Ronitt Rubinfeld and Avrim Blum, who joined the action in the 1980s.) There’s been a great program this year—if you’d like to ask me about it, maybe do so in the comments of this post rather than in the AMA. You are currently browsing the archives for the Adventures in Meatspace category.